Built as a beer restaurant and bowling alley "Bayrischer Biergarten mit Kegelbahn". Later used as a variety theatre. Since 1901, used for drama performances by the resident company. 1903-1926 operated by the "Genossenschaft zum Pfauen" society. 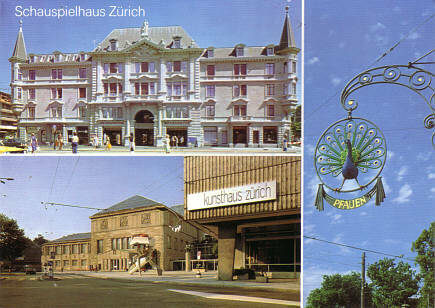 Since 1926, operated by "Zürcher Schauspiel AG". 1926 major rebuilding by Otto Pfleghard and Max Häfeli. Since 1938, operated by "Neue Schauspiel AG". 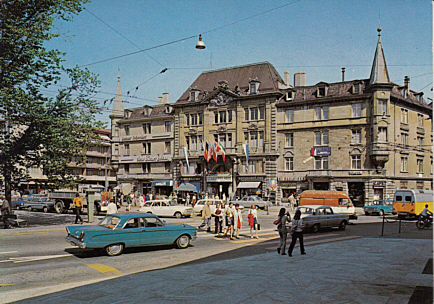 1976-1978 major rebuilding by Schwarz and Gutmann. Main hall: 750 seats. The building also inlcudes the basement studio stage "bunk r" (70 seats). 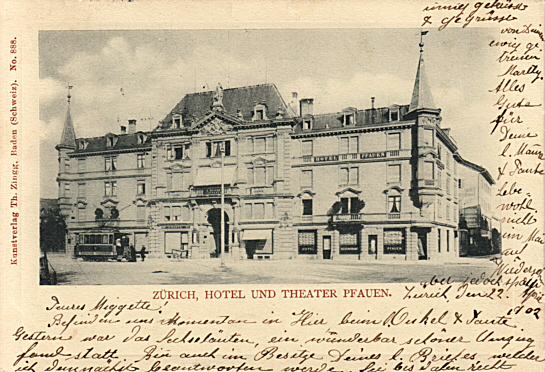 Front Text: "Zürich, Hotel und Theater Pfauen"
Reverse Text: "Zürich, Schauspielhaus Am Pfauen"